The sort() method sorts an array alphabetically. By default, the sort() function sorts values as strings. When the sort() function compares two values, it sends the values to the compare function, and sorts the values according to the returned (negative, zero, positive) value. You may also interested Difference between array and ArrayList with example. In this article we will learn about the Node.js. What is Node , Why node is important, why node is playing an important role in today's app developments. Programe using Node code. 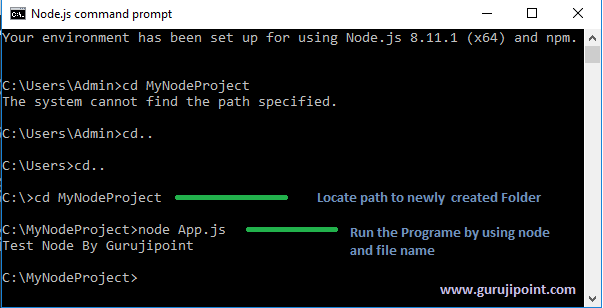 To start with Node.js at first you need to Download the NodeJs Installer. You can download it from their Official Website of Node. 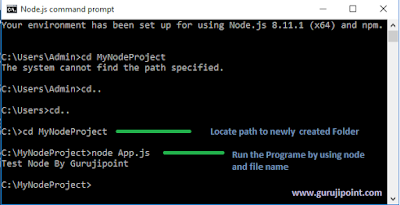 Let's get started by creating the simplest Node.js application and Print "Test Node By Gurujipoint"..
Goto start menu and Open Node.js Command Prompt. Change the path by pressing cd.. on the command prompt, just like the cmd. Now create a Folder where you will put your code file. In my case I created a folder named "MyNodeProject". Now Open VS Code to write your JS code. Create a New File and write a simple Print msg programe in it and saved it as App.js or whatever you want. Note : - Here one thing to remember that Save your App.js file on the same folder which u already create by using mkdir command. In my case folder is "MyNodeProject". node App.js. You can run your file by using node and your Js filename. 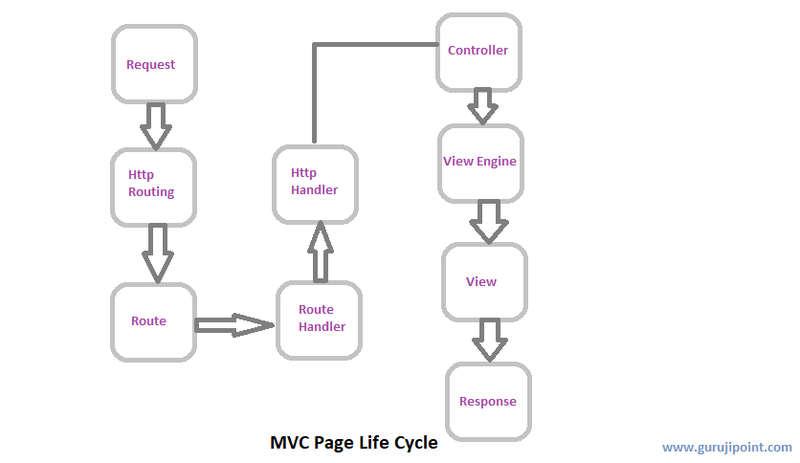 In this article we will learn about the Life Cycle of a MVC Application. 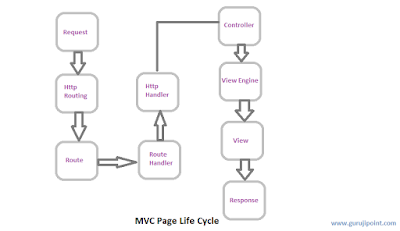 How MVC request handle and how MVC URL request different from ASP request. In asp.net application it is simple, you request for a page in the url like http://DemoWeb\Home.aspx and then it search for that page on the disk and execute the ProcessRequest method and generate the response. However in MVC application it doesn’t work in that way. There is no physical page exist for a particular request. All the requests are routed to a special class called Controller. The controller is responsible for generating the response and sending the content back to the browser. Depending on the URL sent "UrlRoutingModule" searches the route table to create "RouteData" object which has the details of which controller and action to invoke. The "RouteData" object is used to create the "RequestContext" object. This request object is sent to "MvcHandler" instance to create the controller class instance. Once the controller class object is created it calls the "Execute" method of the controller class. The Execute() method gets the Action from the RouteData based on the URL.The Controller Class then call the ContollerActionInvoker that builds a list of parameters from the request. These parameters, extracted from the request parameters, will act as method parameters.The parameters will be passed to whatever controller method gets executed. Finally It will call the InvokeAction method to execute the Action.